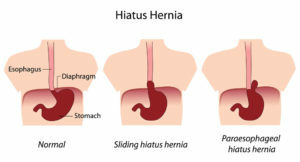 What is GERD/ Hiatus Hernia? Gastro-esophageal reflux disease, commonly referred to as acidity, is a disease where juices from the stomach flow backwards into the esophagus (i.e. food pipe) instead of flowing downwards. This occurs due to loosening of the junction between the food pipe and the stomach. Due to this, the patient experiences nausea, vomiting, and a burning sensation in the chest and upper abdomen. If this continues excessively, the patient may develop a HIATUS HERNIA, in which the stomach moves from its normal position within the abdomen into the chest cavity, and symptoms worsen. This is due to enlargement of the natural defect in the diaphragm, which is the muscle that separates the chest and abdominal cavities. If the condition is allowed to persist, other organs may migrate along with the stomach into the chest, worsening the heart and lung functions. Patients need to undergo an Upper GI Endoscopy and/or manometry. After this, patients may be given a course of medical treatment in the form of antacids. In severe cases, patients need to undergo surgery, to correct the anatomical abnormality. An anti reflux procedure is known as a FUNDOPLICATION. This involves wrapping of the stomach around the lower end of the food pipe in order to tighten the junction. This may be either total (NISSEN’S FUNDOPLICATION) or partial (DOR or TOUPET). Who is a candidate for this surgery? Patients who have severe disease, or intractable symptoms despite maximal medical therapy are candidates for this procedure. The surgery can be performed laparoscopically or robotically. Both involve making 4-5 small cuts on the abdomen with the patient under general anaesthesia. Robotic assisted surgery gives better long-term relief in comparison to laparoscopic repair for chronic large hiatal herniae. Dr. Jaydeep H Palep is a world-renowned surgeon, trained in advanced laparoscopy as well as robotic surgery. He has been associated with all major government teaching medical colleges in Mumbai, and has been in clinical surgical practice for over 15 years. Need help? Contact us right away!